My first car was a K-reg Volvo 440, bought when I was 23. I'd passed my test when I was 18, but as I couldn't afford to buy a car or run it then I waited five years, saving my wages from my weekend job in Marks & Spencers to buy the Volvo before I started my first teaching post. I loved that car and kept it for five years, before changing it for a Renault Scenic. Two further Scenics later and I have vowed never to own another French car; they are so expensive to fix! In the Summer, my latest one proved too expensive to keep and so I've been driving a runaround for a month or so. Yesterday we picked up our first ever BRAND NEW car. And oh boy, did the car showroom make us feel special! It was a very magic moment, such fun! Awesome! 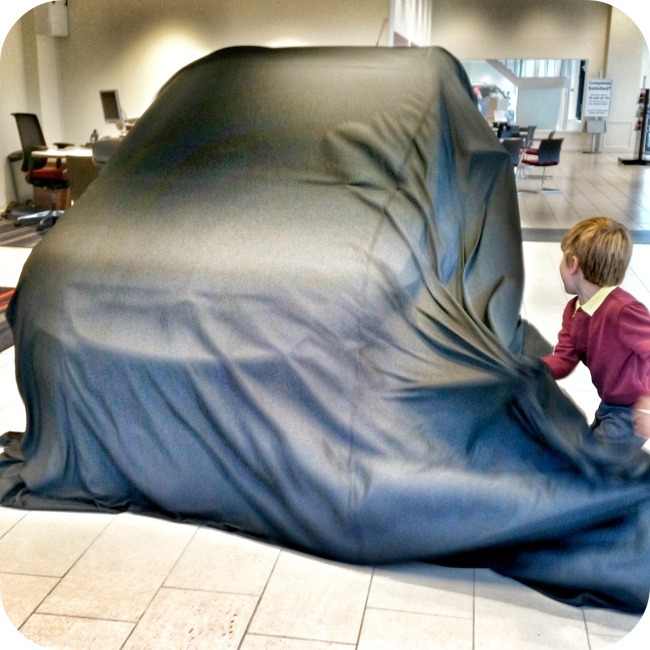 You can see just how excited your boy is to uncover your brand new transportation! Takes me back to the excitement of getting my first car….then the next, and the next, and the..well, you get the point. Enjoy the new car, and I won't judge if you do sleep in it! Thank you for not judging, it's just so lovely and new I don't want anyone to damage or take it, and I want to inhale the freshness of it all. Finding it very difficult letting people wear shoes in it at the moment in case they make it dirty! Now that is an experience he will never forget. Great moment to catch with a photo. I'm not going to either, feels so rewarding to have finally got to the point of buying a brand new car. Ta-dah! Love that photo. What an exciting way to pick up your new car. I passed my test at 17 and got my first car at 25! I've only had two cars of my own – I have to share the new car with my husband. Thank you, it's so exciting! It was very exciting, think that'll last a few weeks yet. It is a lovely newness which involves people wiping their feet before they get in it and not eating in it. I'm sure it'll last two weeks! I couldn't stop laughing it was so funny to be so dramatic! I love this, great that they made you feel special and didn't just take the money and run. That is SO exciting, a brand new car! How amazing that they made it so special for you all. I didn't expect that at all, so lovely. I actually love the car, is that sad? We both were so excited, still riding high on that. I've had the seats coated in PVC, no I jest but they are coated in some repellent. I'm already out to hoover up some of the grains of dirt in there. It was such a special thing to do, I really appreciated it. I honestly wasn't expecting it. Awww! I love this, it takes me back to the D-reg Nissan Micra I had after I passed my test. I also remember my (one and only, probably for ever) brand new car, paid for with my money. I loved it so much having that freedom of choice when buying new (I was 29, pre-children and bought a convertible). Needless to say, my next excitement of that scale will be seeing the children have that experience. How cool is this. I would love to unveil a brand new car! Love this shot, so exciting!